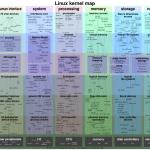 This website presents an interactive architecture diagram of the Linux kernel. The diagram breaks the kernel into a grid of functionality and layers with the ability to pan and zoom the map. You can then click on a specific item to look it up in the Linux source code. One of the problems of providing documentation for a large project such as the Linux kernel is how to make the information manageable to navigate. This interactive diagram is a great way to provide an overview of all the available APIs and gives developers a jumping off point into the API documentation (although in this case it is an index to the actual code, rather than a documentation index).